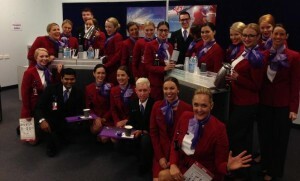 The first Adelaide sourced and trained crew for Virgin Australia. The first locally recruited and trained cabin crew members for Virgin Australia’s Adelaide base graduated on January 20. The 24 graduated have been training and testing for the past seven weeks, and will be part of the 80 new jobs the airline says it has brought to Adelaide since opening its base there. The new cabin crew members will be operating on Boeing 737 and Embraer 190 equipment to all mainland state capitals, the Gold Coast, and up to Bali.